A couple of weeks ago Matt and I went to stay with his brother Jono and his girlfriend Jackie, in Jono’s cosy little apartment in Paris (the lucky bugger). Even though it was still November, it felt like a weekend with such Christmas vibes – for one thing it was about 5 degrees colder than London. 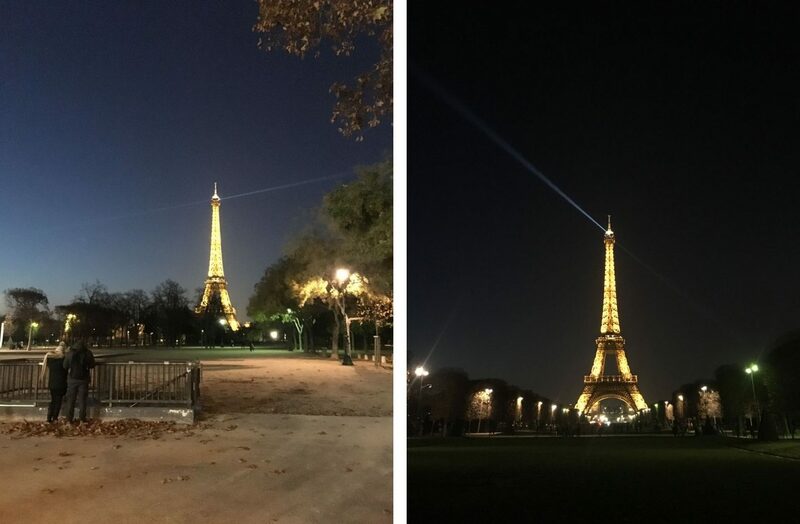 Our first night we walked around the 15th arrondissement and ended up on the Champ de Mars, which we totally unintentionally managed to time perfectly for the sparkling lights on the Eiffel Tower. The Eiffel Tower at night, down the Champ de Mars. 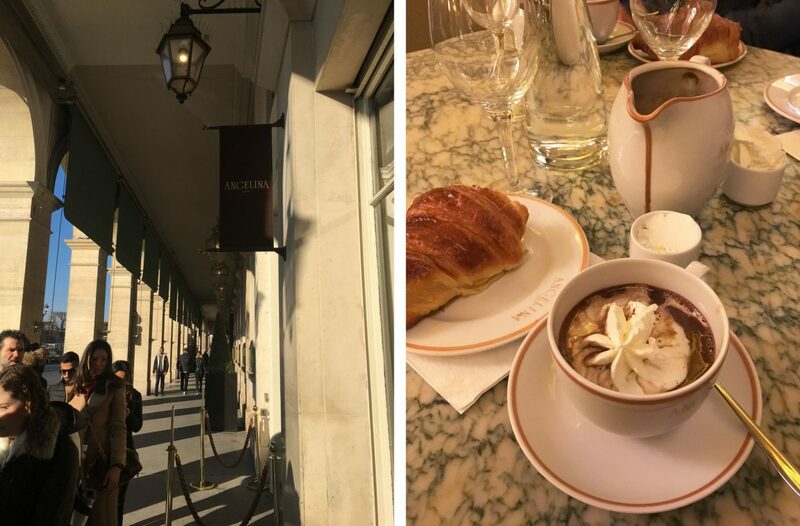 The next morning I took Matt and Jackie to my favourite hot chocolate joint in Paris – Angelina. If you’ve read my post Where to go on your first trip to Paris, then you know how I feel about Angelina’s. It’s best to arrive early to mid-morning, as the queues here build up really quickly. The pastry counter inside Angelina. Named after the founder’s daughter-in-law in 1903, this grand tearoom has hosted the likes of Proust and Coco Chanel. At the entrance you are greeted by a counter of the most intricate little French pastries, perfectly and extravagently decorated with bright icing and chocolate sculpture. 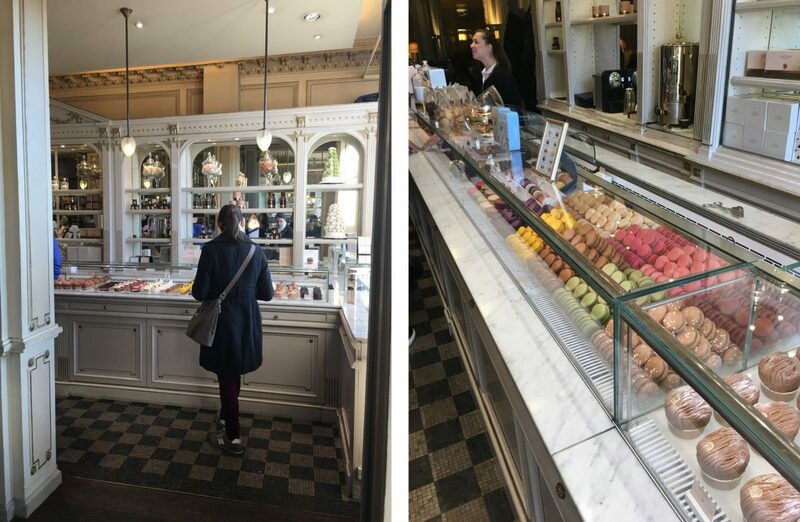 You can buy pastries and rainbow selections of macaroons to take away, or you can join the queue for a table in the tearoom, where you simply cannot leave without ordering Angelina’s signature African hot chocolate. Left: The queue outside. Right: Chocolat chaud with chantilly cream. Made with a secret recipe from three types of African cocoa, Angelina’s hot chocolate is the thickest, richest and smoothest that I have ever indulged on in my whole life. Nothing is more filled with promise than a full jug of velvety melted chocolate and a small cup of whipped Chantilly cream, waiting for you to mix at the ratio that you desire. Is there any better way to warm up on a chilly morning? 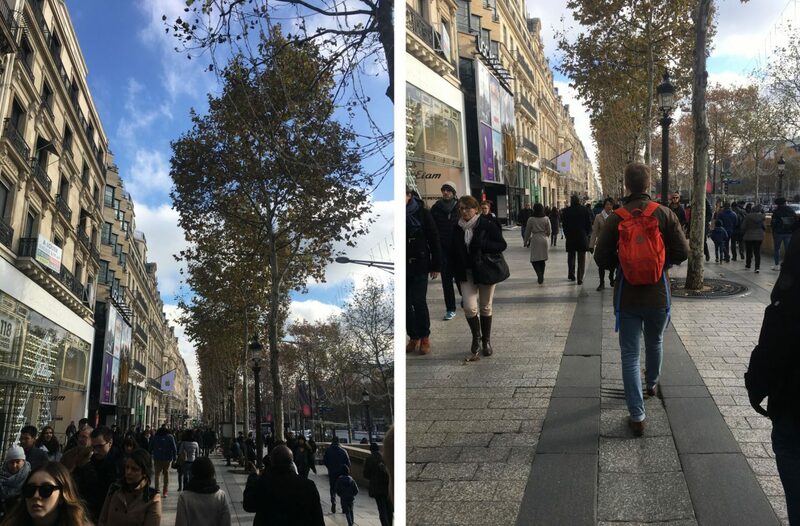 Next we walked down Avenue de l’Opéra, on a mission to get to my favourite Christmas spot in Paris – the Galeries Lafayette on Boulevard Haussmann. 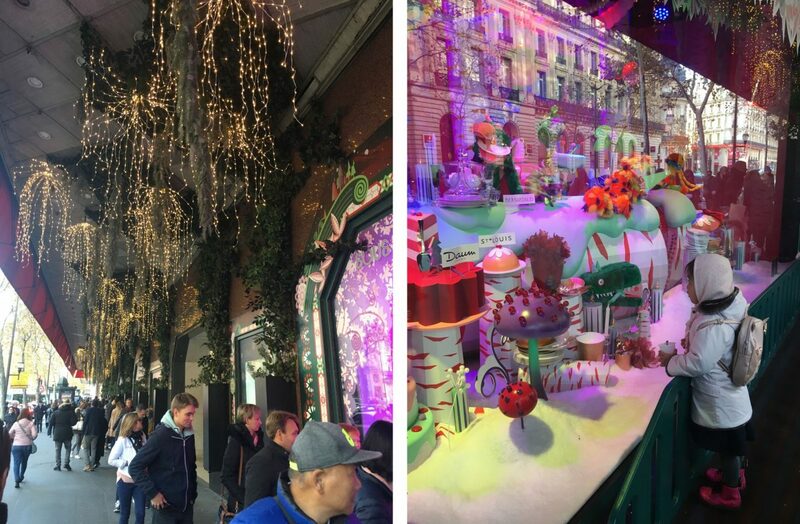 This time of year their decorations are some of the best in the city, and their window displays are unmissable. The cutest part is that they install little festive platforms in front of them just for kids, so they can watch the animatronic displays. Left: Christmas decorations at Galeries Lafayette. Right: Christmas window display. This year the theme seemed to be… some sort of high glam, zany fluorescent Christmas dream scape, like it was designed by David Bowie and Noel Fielding. 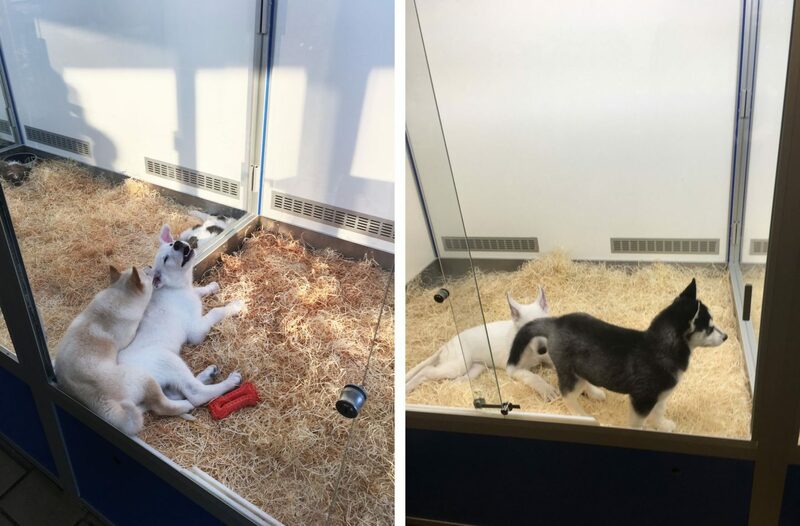 In one of the windows the toys seemed to be eating each other?? 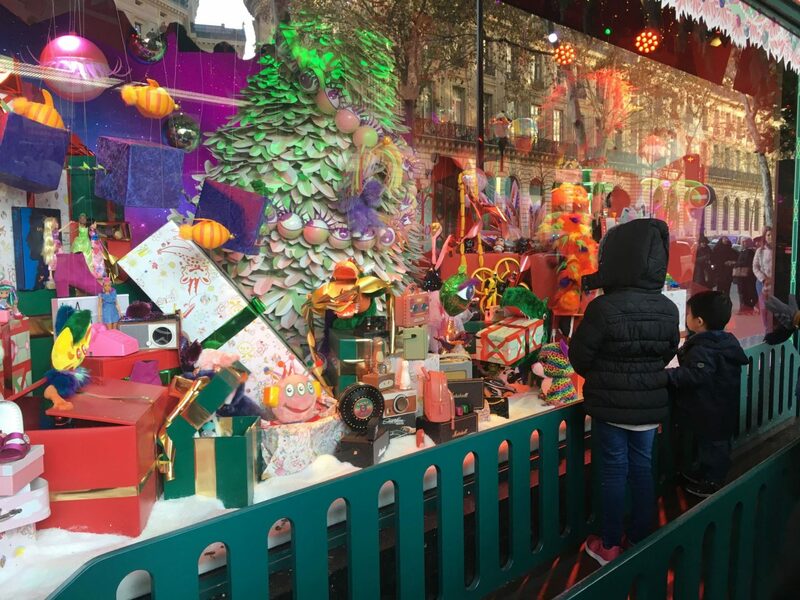 Children watching the dynamic Christmas window displays. But the best bit is inside. In the centre of the Haussman building (there are three – Haussman, Homme and Maison) underneath the grand stained glass iron wrought dome (which is impressive enough on its own) is an enormous suspended Christmas tree surrounded by a waterfall of hanging string lights. If you hang around long enough the lights will sparkle through a rainbow of colours in time to the Dance of the Sugarplum Fairy from the Nutcracker. 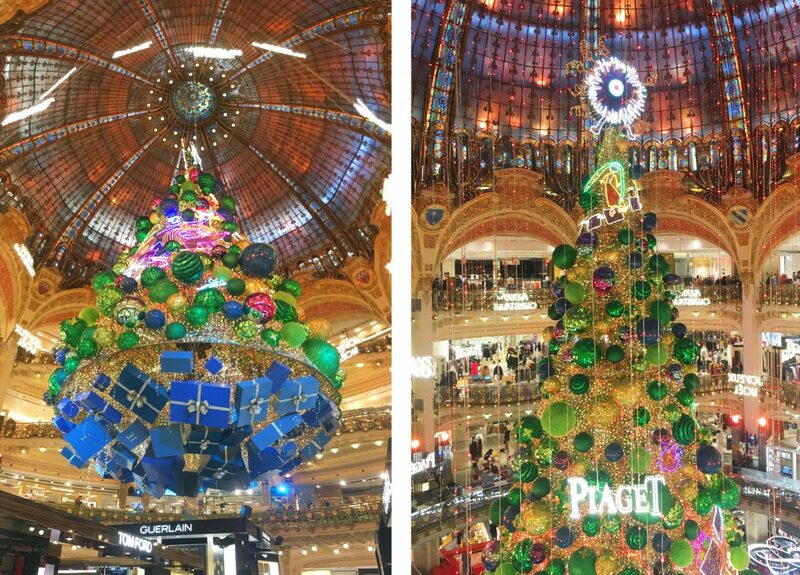 The incredible suspended Christmas tree inside Galeries Lafayette. For lunch I lead everyone back to Marché Saint-Honoré to one of my favourite French restaurants, Le Zinc d’Honoré. 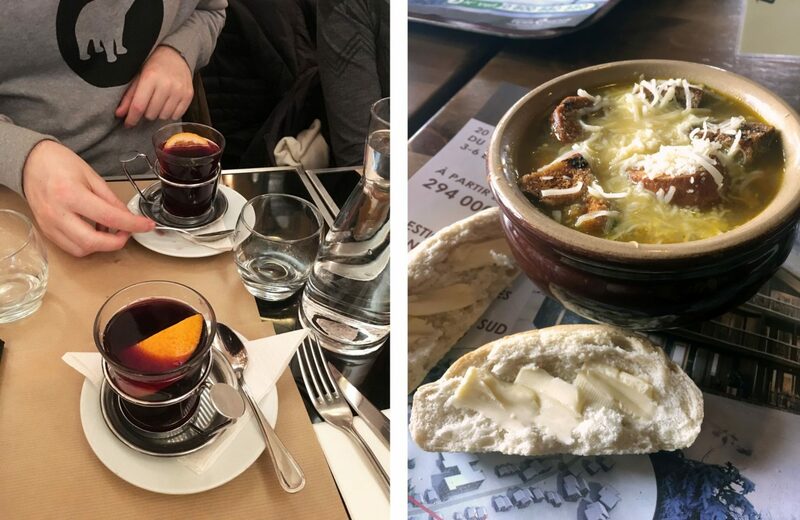 After some vin chaud (like mulled wine but slight less sweet), Matt and I tucked into Croque Provencal (a Croque Monsieur with tomatoes) and Soupe à L’Oignon respectively, just the sort of warming pick-me-up needed after a morning of walking around the wintry streets. 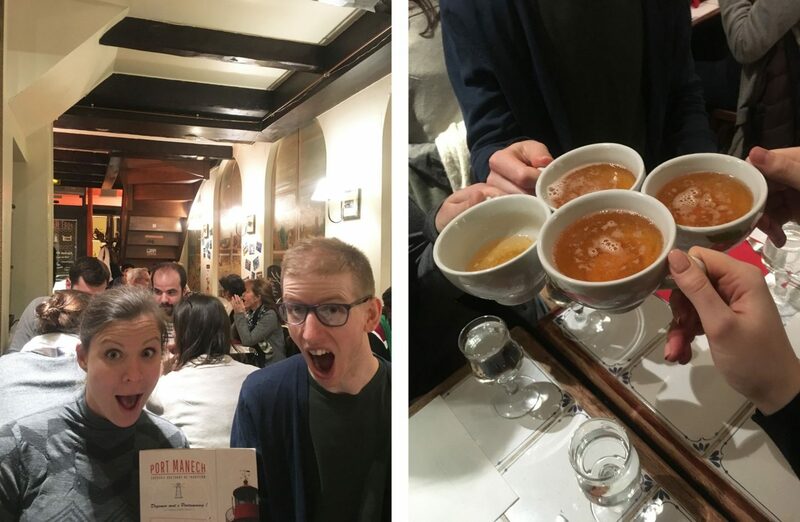 Left: Vin chaud. Right: Soupe à l’oignon. The Palais-Royal opposite the Louvre used to be a royal palace, and now houses the Ministry of Culture. Originally owned by Louis XIII, it has served as the main residence for various members of the royal family, and as shelter to the wife and daughter of King Charles I after the English Civil War. In 11786 it became one of the most famous shopping arcades in Paris, and although the covered arcade was demolished in the 1930s, there are still many art galleries and boutiques around the edges of the gardens today. Left: Place Colette. 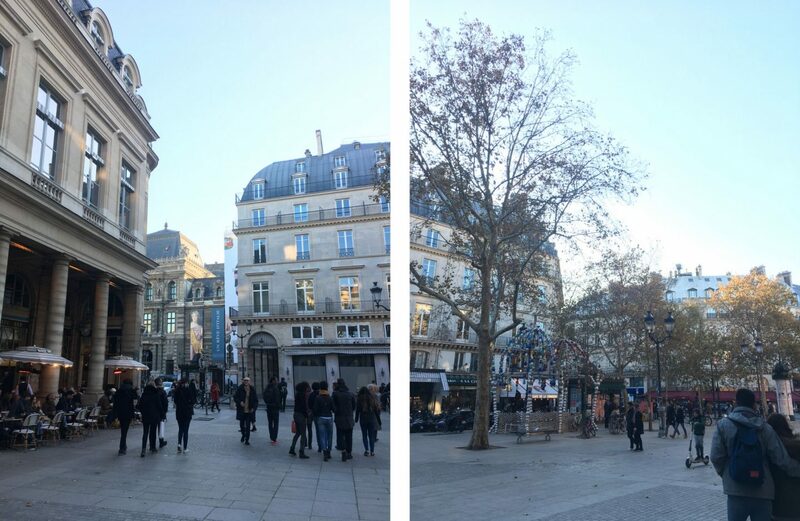 Right: Metro Palais-Royal. 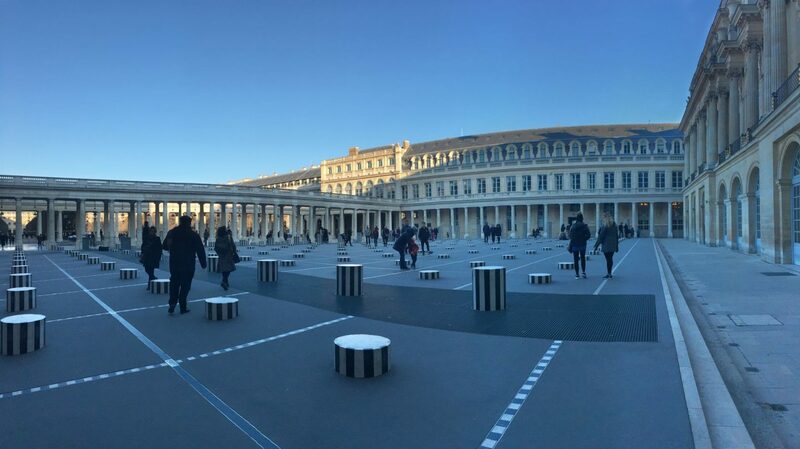 My favourite section of Palais-Royal is the courtyard where Les Colonnes de Buren, stripey marble columns by artist Daniel Buren, puncture the ground at regular intervals at irregular heights. 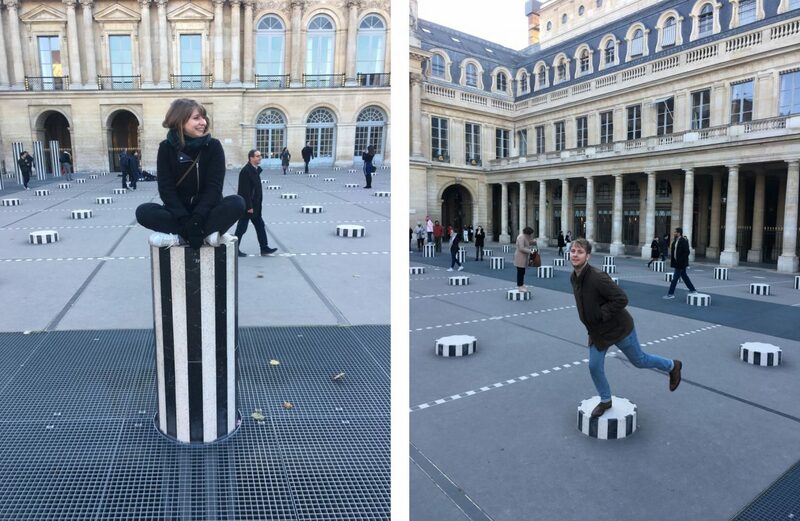 Colonnes de Buren inside Palais Royal. If you don’t stop to snap some shots on these then you must be some kind of monster. In fact, the courtyard is littered with locals and tourists at all times of the year. When we were there some sort of modelling agency or fashion brand was photographing some very cold looking girls perched on top of columns in strappy dresses and high heels. The dividing courtyard between the columns and the gardens are all that’s left of the 18th century arcade that used to be so popular. Now it’s only contents are the fountains of Pol Bury at either end. The gardens themselves are very typically Parisian, with classic pond-like fountains where locals gather in metal chairs, ringed by autumn trees. 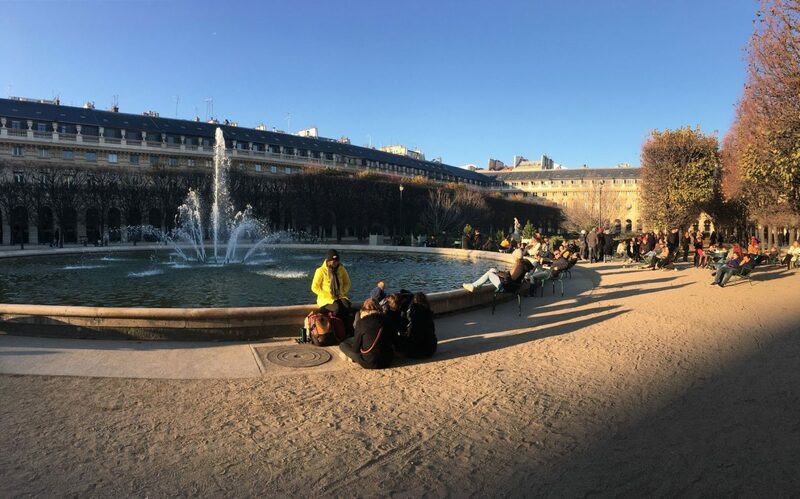 Parisians catching the last of the sun in Jardin du Palais Royal. 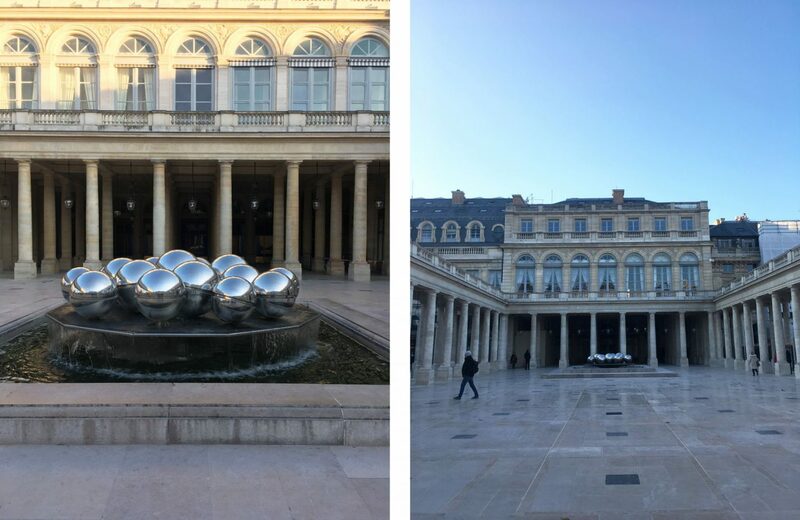 After exploring the Palais-Royal Matt and I decided to go on a little walk to Ile de la Cité, which took us on a beautiful sunset route through the Tuileries Gardens and past the vintage book stalls by the Seine. Cour Napoléon in front of the Louvre. 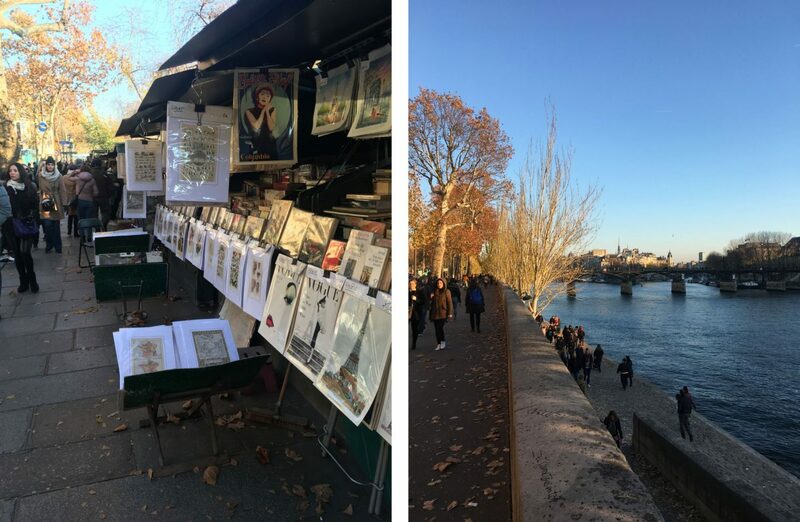 The Quais de Paris is a great place to go for some authentic souvenirs of the city. Avoid fridge magnets and keyrings and cheesy caps – go for some vintage French posters or books. Left: Bouquiniste Quais de Paris. Right: The Seine river. On the next section of road is heaven if you’re an animal lover. Oisellerie Du Chatelet on Quai de la Mégisserie not only stocks birds like its name suggests, but also kittens, puppies, rabbits and hampsters. I took Matt here on our first trip to Paris and now he insists on going back every time we’re here – I think it’s all part of his campaign to persuade me to get a cat. Puppies in Oisellerie Du Chatelet. Crossing over Pont Notre-Dame at sunset is a beautiful sight. 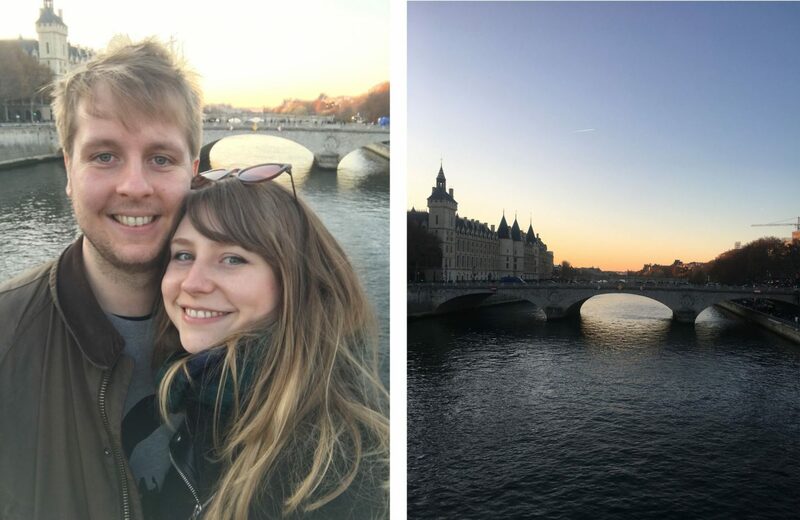 How could you not stop to appreciate the orange sky fading to dark blue, the glow of the white walls of the Conciergerie, and the bridges over the Seine casting their long arching shadows onto the ripples of the water? Sunset over Pont au Change. 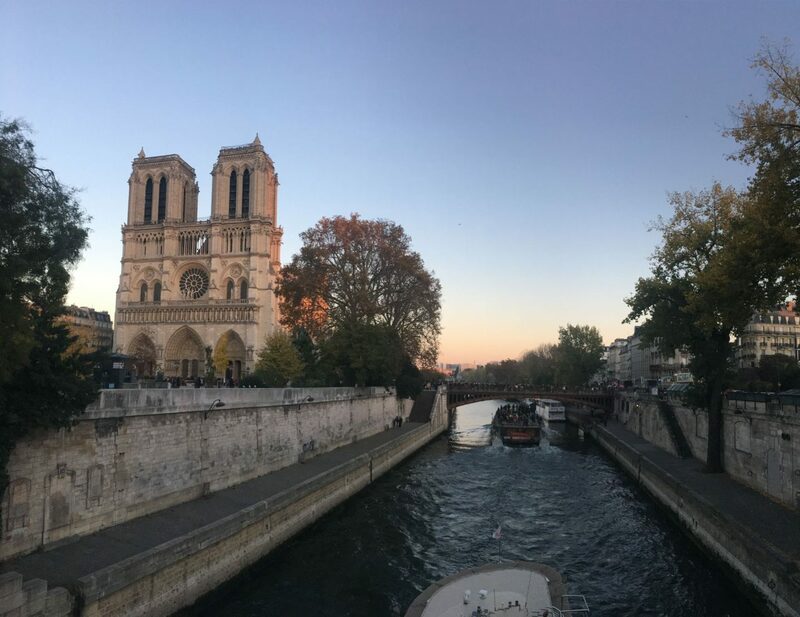 We timed our walk perfectly and just managed to catch the warm orange light of the sunset cast on the Notre Dame cathedral. View of Cathédrale Notre-Dame from Petit Pont. 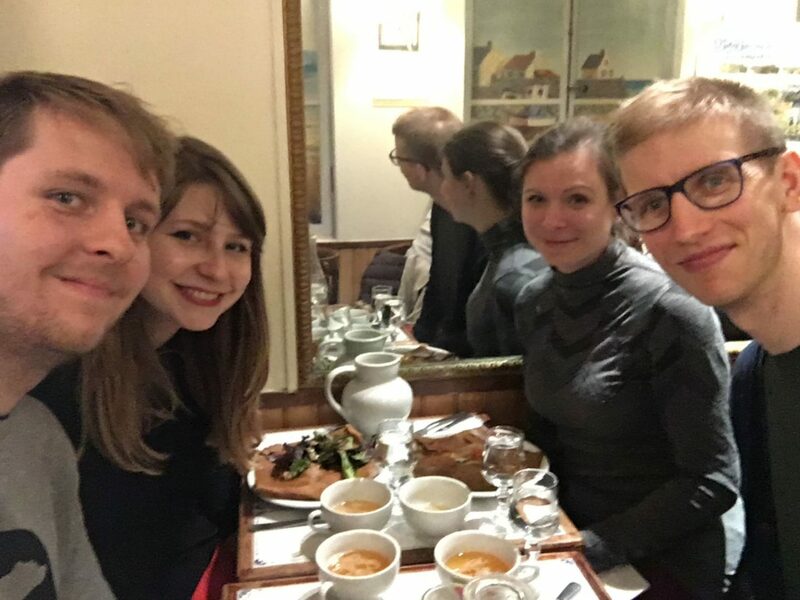 I love discovering new restaurants in Paris, and Jono took us to what I now think may be the best crêperie in the city. Port Manech in Montparnasse (incidentally the crêpe hub of Paris) serves delicious Brittany cider in ceramic jugs, drunk from cups, and makes all the crêpes on site as you order them. Left: Jackie and Jono super excited for crêpes. Right: Delicious Brittany cider. If you like cheese, I highly recommend the galette that I ordered – the Sarzeau, with Reblochon cheese, potatoes, bacon, onions, crème fraîche and salad. 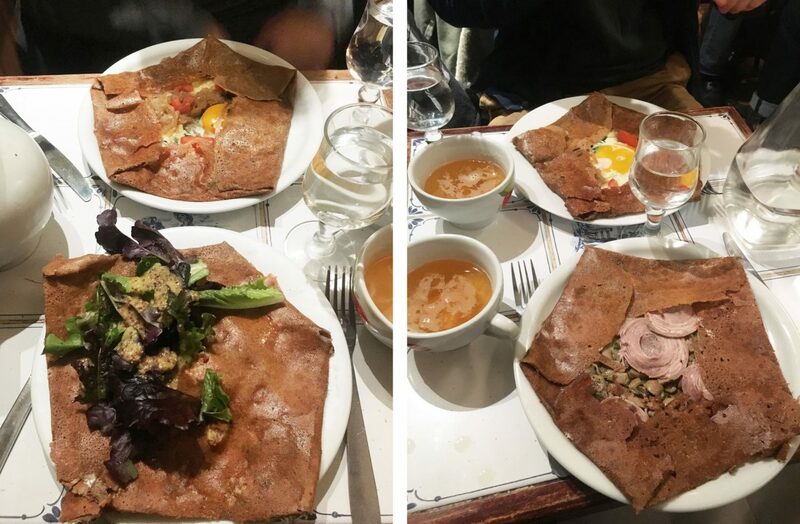 Our insanely amazing buckwheat crêpe, otherwise known as galettes de sarrasin. For dessert we shared three crêpes between the four of us – Suzette (flambé with Grand Marnier), Port Manech (flambé with cider liquor, cooked apple and vanilla ice cream), and Cancale (salted caramel, cooked apples and shortbread ice cream). Matt and I agreed that the Suzette was the best, with the freshly crêpe going perfectly with the melted butter and swimming in citrus. On the last day Matt and I struck out by ourselves to soak up some more Paris before catching our Eurostar home. 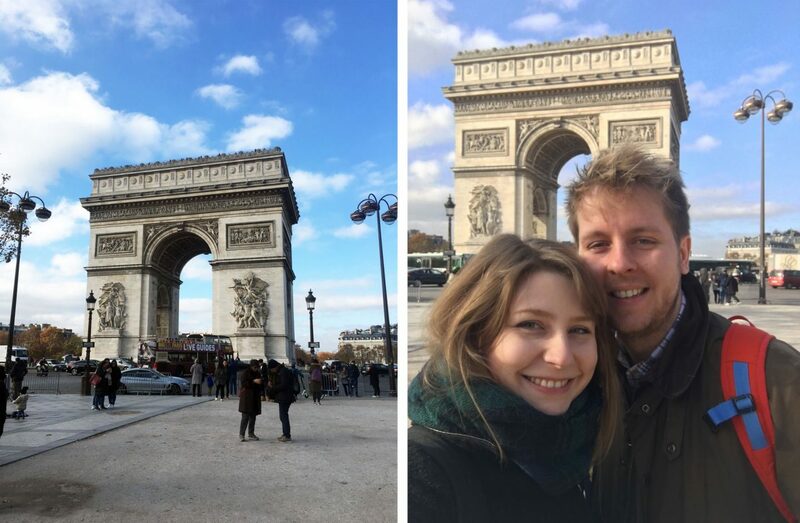 We started at the Arc de Triomphe, standing proudly at the Western end of the Champs-Élysées, at the centre of Place Charles de Gaulle (aka the craziest roundabout in Europe – can you believe we used to cycle round this as kids?). The Arc de Triomphe on a cold November morning. The Arc de Triomphe is the perfect place to arrive if you want to walk down the Champs-Élysées, which is exactly what we had planned. Along the walk we popped into the Swatch shop and the Disney store. Disaster struck when we tried to find our regular macaron shop Raymond – it’s been replaced by a tacky souvenir shop! Heartbroken. For lunch we veered off the Champs-Élysées and tried to get as far away from the tourists as possible. We ended up at Le Président, a brasserie packed with French diners eating steak tartar or drinking espressos. 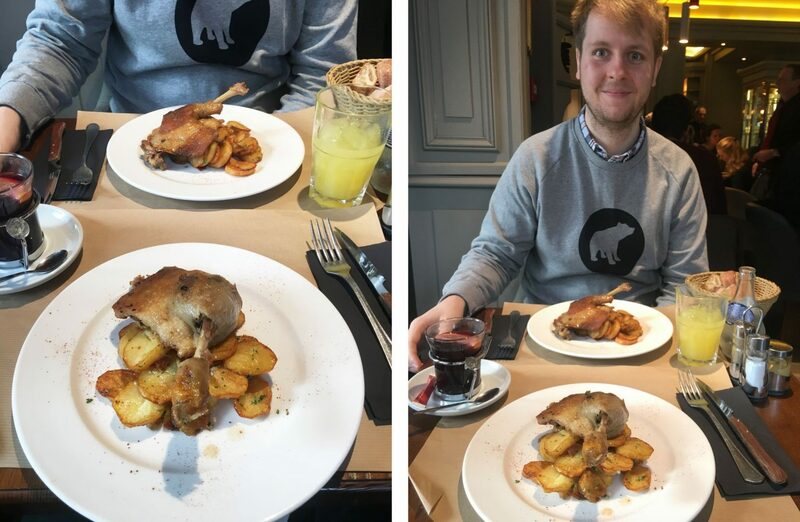 We ordered confit de canard which came with perfectly sautéed potatoes that had been garlicked to within an inch of their life. We left extremely happy and smelled like garlic for the rest of the day. Worth it. Confit de canard with sautéed potatoes from Le Président brasserie. 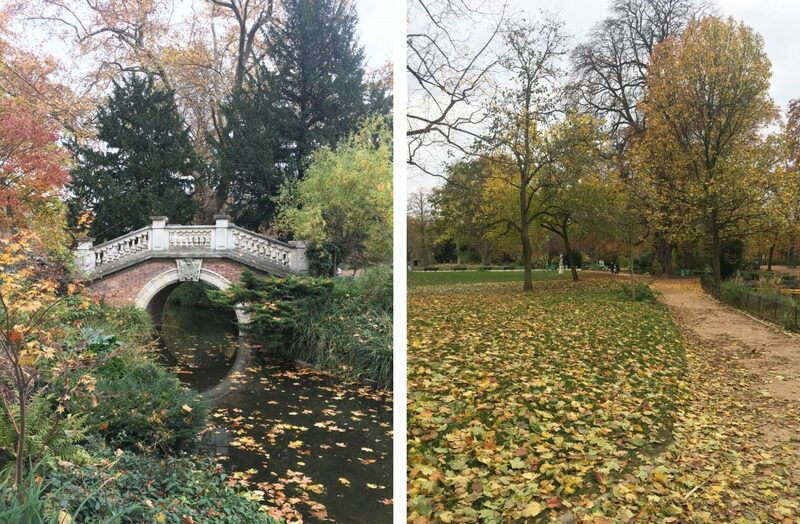 We had an hour left before we needed to leave for Gare du Nord so we made our way to Parc Monceau, a park from my childhood days in Paris that holds a special place in my heart. And why not? 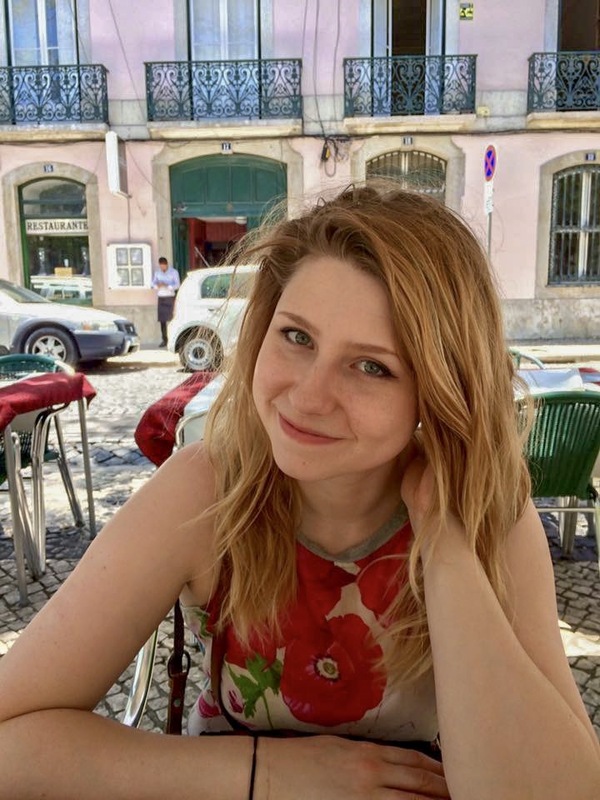 It has so many highlights – a large domed pavilion at the entrance, green lawns where Parisians can relax in the summer, a pretty Venetian bridge, a grotto with a waterfall, a roller rink, a vintage merry go round, kids’ play park and lots of gnarled trees that are perfect for climbing. Left: The Venetian bridge. Right: Fallen leaves on the pathways. The park is quite unusual in France because of its historical English style with curved walkways and randomly placed statues. Dotted throughout the park are a collection of scaled-down architectural features, or follies — including an Egyptian pyramid, a Chinese fort, a Dutch windmill, and Corinthian pillars. 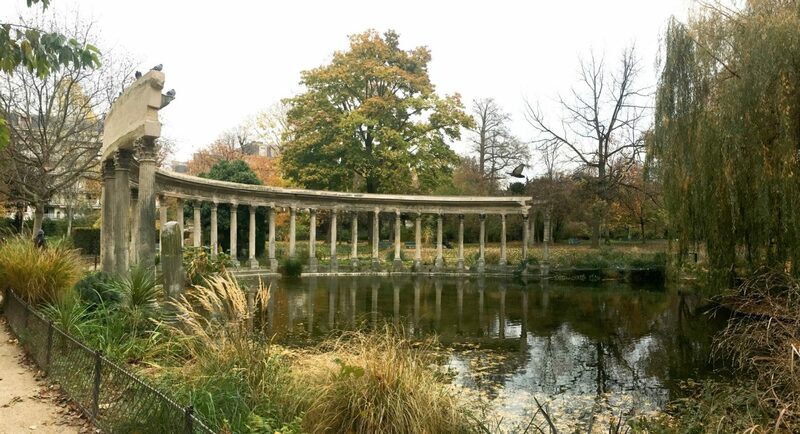 The Corinthian pillars of Parc Monceau. After winding our way around the paths we felt we’d made the most of our day, and got the metro to the station. 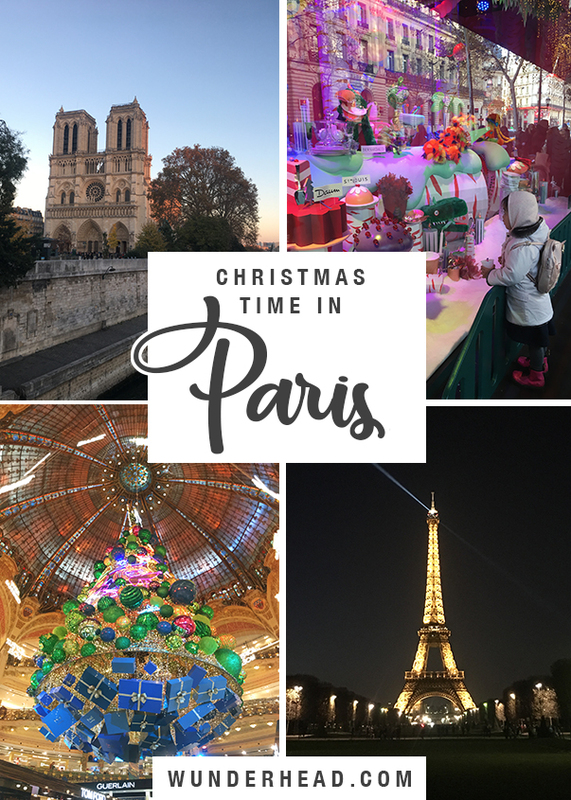 Although it’s freezing in Paris at Christmas time, as long as you’re properly bundled up there are so many beautiful sights to see – and after walking around this fantastic city you have so many delicious ways of warming back up!